Video Slots have long been one of the more popular forms of online gambling. Virtually every live and online casino will have a wide range of video slots games for all of their members. For those new to online casinos, the sheer variety of games can be quite overwhelming. The key is to find a video slots game that is fun, profitable, and keeps you entertained. One of the bigger online casinos, Cool Cat Casino, not only offers a wide variety of games but they provide their members with some great perks as well. At Cool Cat Casino there are more than 80 different slot games. Every variation comes with its own jackpot that can turn your day around in a hurry. To check out any of their games just open the lobby, click on slots, and then select any of the 80+ games. Once the game opens you will see the main screen with your balance, bet amount, win amount, and jackpot. If you are unsure of the rules of the game click the Help button at the bottom right-hand side of the screen. This will bring up an additional screen that will explain each game’s specific rules as well as its payouts. 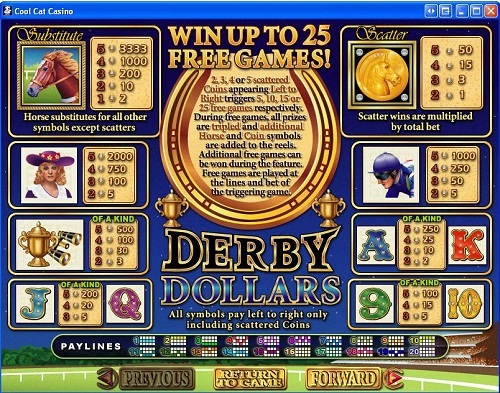 For example, in the Derby Dollars screenshot shown above, players can see all the payouts based on what they connect when they spin the slot reel. In this unique game centered around horse racing, players can win free games if they hit anywhere from two to five scattered coins after a spin. Other payouts include hitting a pair or better of nines, tens, jacks, queens, kings, and aces. There are also game-specific symbols including a jockey, horse, and trophy that payout much more than the playing cards. Once you are done studying the rules just click on the “return to game” button and you can begin playing Derby Dollar Slots. Betting in these video slots games is quite simple; all you have to do is pick a bet amount, as well as the number of lines you would like to wager. The more lines you play the better chance you have to win! Playing more lines will also help you clear deposit bonuses at a much faster rate. Cool Cat Casino offers many different bonuses including a $100 no-deposit bonus as well as a deposit bonuses that can be as high as 1000% up to $1,000. There are also other great promotions like the random jackpots that anyone can hit at any given time. These can range from just $1,000 to $25,000 or more. When all else is equal it is wise to play the game with the biggest random jackpot. Playing video slots online is a great way to have some excitement at home. Instead of getting dressed and heading down to your local, smoke-filled casino, you can play some of your favorite games from the comfort your computer chair. Be sure to check out the rules of each game before taking your first spin. If you have any extra questions most casinos will have a live chat expert standing by to help you out.